You have worked hard and studied hard. Now, it is time for a bonus and to treat yourself for all that hard work. Get your $500 Bonus Cash in addition to the current incentives! Are You a Current College Student or Recent Graduate? The Ford College Student Purchase Program provides eligible college students and recent graduates with bonus cash, plus great rates through Ford Credit when you purchase or lease a new Ford vehicle from Rusty Eck Ford. Complete the registration, and print out your certificate. 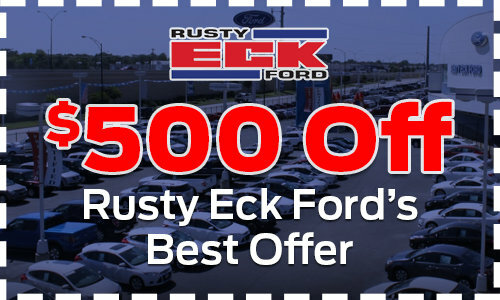 Bring the certificate with you to Rusty Eck Ford, and pick out your new Ford!